As the book's title indicates, William G. Howell and Terry M. Moe believe that the Constitution was drafted for purposes more appropriate for a bygone era and that today it prevents the political system from addressing pressing national problems. In making this claim, the authors try to distinguish their argument from contemporary critiques of the political system that focus on a polarized Congress, a faulty electoral system, a divided public, or the role of money, to name some of the most commonly cited explanations for the nation's political dysfunction. The problem, they argue, runs much deeper, rooted in a document written during a vastly different time, when expectations for what the national government should do were much lower and political participation was far more restricted than is the case today. Real reform will occur only by recognizing that the Constitution is a relic and proceeding accordingly. Their argument unfolds in four chapters. The first summarizes the Framers’ goals when writing the Constitution, most notably, the desire to establish a more effective government based on popular consent, but with limits to direct popular participation. Within a century, however, this system of shared powers, superimposed on existing state governments, became increasingly anachronistic as barriers to political participation fell and the public's desire for a more effective national government grew. This disconnect between expectations and government capacity spawned the Progressive movement—the first sustained effort to reform the system of shared powers. Perhaps the most important consequence of this reform effort, the authors suggest, was the effort to strengthen the presidency, in part by accentuating the office's ties to the public. Unfortunately, the authors contend, the Progressive reforms were only partly successful in overcoming the barriers to effective government posed by the Constitution. In particular, as they describe in Chapter 2, Congress is particularly plagued by structural inefficiencies rooting in constitutionally derived incentives. Three in particular stand out: members are parochial, focused primarily on appealing to their constituencies in order to win reelection; because of frequent elections, they operate under a too-short time horizon; and the geographic basis of representation means policy tends to be constructed in piecemeal fashion. The result is a Congress that often cannot act, and when it does act, it does so in a haphazard fashion that is more likely to replace old problems with another, more durable problem set. How to remedy these structural defects? By strengthening the presidency. 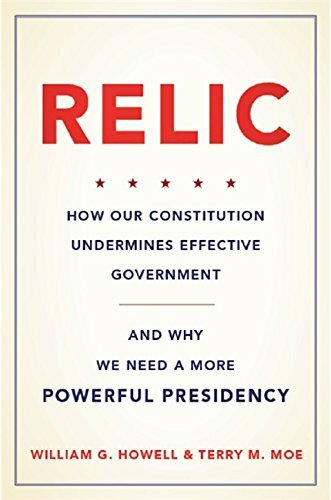 As the Progressives recognized, and as Howell and Moe discuss in the book's third chapter, the presidency as an institution has attributes that Congress lacks: it is a unitary office, one whose occupant has incentives to think both nationally and long term for reasons of historical legacy. To demonstrate the difference between the two institutions, the authors present a series of case studies ranging from Dwight D. Eisenhower's push for the interstate highway system through George W. Bush's failed effort to reform the social security system to show how presidents, in contrast to Congress, do try to exercise leadership directed toward solving national problems and that when they fail, it is primarily because of Congress's institutional deficiencies. To this point, the reader might wonder whether any of this argument is really all that new. Efforts to reform the defects associated with the constitutionally based system of separated powers by strengthening the presidency has a long intellectual lineage. In the 1980s, for example, many scholars believed the only way to address the burgeoning structural budget deficit was through institutional reforms designed to allow the president to form a government amenable to his direction, much like prime ministers in parliamentary systems. But it is here that the authors’ argument becomes distinctive. Whereas previous reform efforts focused on large-scale institutional change, such as coterminous elections and terms of office for the president and Congress, in Chapter 4, the authors propose a much simpler reform: amending the Constitution to give the president fast-track authority on all presidential proposals. This would entail two key provisions: forcing Congress to vote on all presidential proposals within a fixed time period, but only in an up-or-down fashion. The virtue of this reform, they suggest, is that it builds on the president's institutional advantage as a unitary actor with national orientation but still allows for Congress to weigh in on policy, albeit in a manner designed to ameliorate the impact of its more dysfunctional tendencies. Moreover, they point out that their proposed reform builds on existing fast-track trade policy, so it has the virtue of familiarity, in contrast to many proposed constitutional reforms. This is an extended advocacy piece, crisply and concisely written, that will appeal to lay persons as well as political scholars and practitioners. Whether one agrees with the reform may depend in part on how one answers the age-old debate that dates back to Alexander Hamilton and Thomas Jefferson: do we have more to fear from a government that fails to act, or from one that acts in ways that endanger basic liberties? In this respect, some readers will find the authors’ assumption that, in the era of Trump, the presidency is an office focused on the long-term good of the nation a bit too optimistic. Similarly, critics may find fault with the authors’ focus on legislative productive as the sine qua non of effective government. As the authors would surely respond, however, nothing in their proposal prevents Congress, and the courts, from protecting basic liberties, and from blocking a president's proposals from becoming law. Their larger point is that judging the current governing framework using standards dating back two centuries is no longer tenable. It is a perspective that merits consideration, even if one disagrees with the specific reform.